Home Health Information Are your holiday decorations making you sick! During the winter months most of us spend more time indoors, which exposes us to allergens and irritants like dust mites, pet dander, and household cleaners; and for individuals who suffer from allergies, this can make their lives miserable. For most of us, the holiday decorations are up for several weeks during December collecting dust and mold spores and then are placed back in their boxes , only to collect more dust the next year. To keep the allergens to a minimum, take the artificial greenery, including the tree, outside and give it a good shake (or vacuum) before packing it away. Be sure to remove the dust from all other holiday decorations, with a quick wipe with a damp cloth. Besides dust mites, mold spores can cause additional problems for allergy suffers, because mold spores can grow anywhere that has moisture and oxygen. Here are some suggestions to keep mold and dust allergies in check during the winter months. ~Turn on exhaust fans when taking a shower to reduce humidity. When using a humidifier or dehumidifier make sure that you maintain an indoor humidity level of 30 – 40 percent. 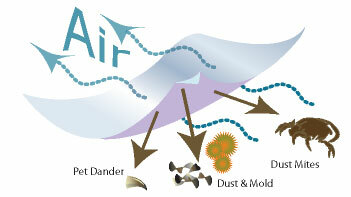 ~Use a HEPA vacuum to reduce pet allergens and remove dust mites. ~Change the furnace filters regularly, this will help prevent the recirculation of indoor pollutants such as dust mites. ~Wash sheets, including the pillow cases and pajamas in hot water to kill dust mites. ~Wash your hands after playing with pets, and avoid having your pets sleep on the bed. ~Check for signs of mold and identify areas that smell musty or may be at risk for mold growth, such as shower curtain or window frames. If the allergy symptoms continue, talk to your health care practitioner about treatment options. During the winter months, make a commitment to vacuum and dust at least twice a week, change the bed linen once a week, change your pillowcase twice a week, use eco-friendly cleaners and brush your pets 3 to 4 times a week. This commitment will keep the allergens in your home to a minimum, and ensure that your home is a happy and healthy place this holiday season.